Purificup has asked me to do a review of one of their portable survival water purification units. Upon receiving the unit, #2203 Natural Water Purifier in Green, the first thing that struck me was it's compact size, much smaller than I had anticipated - This is a good thing as it will not take up valuable space in your Bug Out Bag, Emergency Preparedness kit or Backpack. It comes shipped in a semi-transparent plastic outer tube that has a cap and a string attachment on one end, and a small weep hole on the other end, take the cardboard sleeve off and - SAVE THIS. Any manufactured water filtration system that you put turbid water through will clog the filter and / or shorten the life of the filter, it does not matter who makes it. It's just good common sense to use a pre filter - especially in a survival situation. Secondly, the transparent tube can be used for transport after you have used the water filter - when you're finished wipe the entire unit down and dry it off to prevent cross contamination with the actual drinking cup - then place the entire a water purification system unassembled back into the plastic tube. The weep hole on the end of tube end will enable airflow when it is in long transports, this will allow the unit to dry when your situation does not allow you to let it sit out in open air for proper drying between uses. The actual set up is pretty straight forward, soak the filter in cold clean water for a few minutes, take it out and give it a shake, then run 2 full receptacle cups through the unit. Ion Exchange Resin: Turn hard water into soft water by removing heavy metals (lead, copper, cadmium, mercury, etc) and calcareous (magnesium, calcium ions). Activated Carbon: Remove chlorine and other organic odor including THM, organic solvent, and pesticides. Silver Membrane: The membrane eliminates 99.99% of the pathogens in natural water sources such as streams, falls, creeks, and rivers. It is located on the inlet and exit of the filter circulation channel, preventing the filter cartridge from contamination. Absolute 1 micron filter for additional layer of protection against bacteria. The silver membrane filter eliminates up to 99.99% of bacteria, parasites, and pathogens such as E.coli, giardia, crypto, etc. So there is no need to boil the water after it is filtered - each filter gives approximately 12 gallons, or 100-150 cups. You can filter directly into sports bottles such as Nalgene, CamelBAK and most other generic bottles. It is light weight and compact - weighing less than 11 ounces (305 grams). It is BPA Fee - Very Important feature - BPA has been shown to mimic estrogen and disrupt the immune system, the last thing you want in a survival situation. It has 3 rotating counter rings on the unit, this allows you to keep track of how many cups you have filtered, that way you know when you are approaching the end of the filters life span. The price point is reasonable - Around $60 for the complete unit, which includes the initial filter - replacement filters run around $15 for the unit I have - also reasonable. 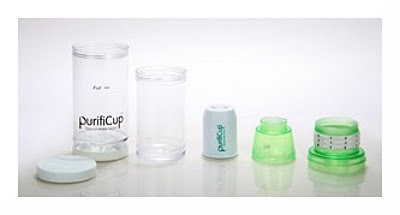 Highly Recommended - Purificup has become a permanent addition to my survival preps - it should be in yours too!